03/Mar/2016 Posted By admin one comment. According to a report by Gartner, Adobe Experience Manager is currently the best Web Content Management(WCM) service provider. It scores pretty high in its Magic Quadrant in terms of Completeness of Vision Vs Ability to execute. Adobe Experience Manager is basically an enterprise-grade web content management system which offers a wide array of powerful features. It enables organizations to create, manage and optimize digital customer experiences across an increasingly fragmented number of channels including web, mobile apps and sites, and social communities that build brand loyalty and drive demand. Their tagline reads “Delivering next-generation digital customer experiences across online and in-person interactions”. The success of any WCM doesn’t depend on the number of features it provides but how aligned is the product’s direction towards the goals of its customers and the enterprise needs. Here are some of the reasons which companies should look forward while selecting Adobe Experience Manager as their preferred WCM. Adobe Experience manager has a very easy-to-navigate dashboard. It gives the editors the opportunity to manage projects in a central environment. Every project is basically a group of resources that are linked together and are represented in the form of a tile. 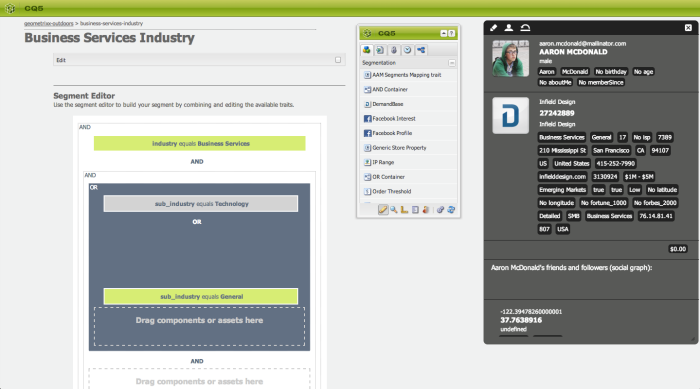 Here is a snapshot of a sample dashboard of AEM. AEM gives users this comprehensive possibility to add several types of information to their projects. While the most used ones are the websites and their assets associated with it, linking external links, project information, team information and tasks associated with their projects is also configurable by the editors in AEM. 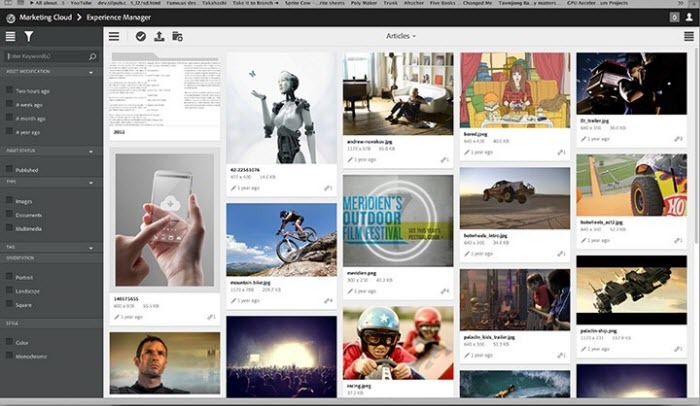 The AEM Dam is a fully integrated digital asset management tool that gives editors the possibility to manage and distribute assets throughout their website. Editors can store various type of assets in the folders created, in terms of images, videos, and documents to help them easily navigate within the Dashboard. Another strong point of DAM lies in terms of its strong drag and drop structure of the assets. Editors can also work extensively on the set of information per asset, including copyright data and many other metadata properties. DAM makes the process of editing and publishing the assets really intuitive and easy even for a beginner. Content is the core of a great digital experience for any WCM. These tools help practitioners - content authors, editors, site designers, marketers, product managers and many more to create and manage a content-driven strategy. In AEM, the pages exist of a number of components or building blocks that can be dragged on the page for creating extra content. AEM follows a WYSIWYG structure which helps editors to visualize how the final result will be after they have implemented their designs. For some blocks it's even possible to use in-place editing. With the AEM’s full DAM integration, it’s also possible to search for a particular asset and to drag and drop it onto a desired place on the webpage. AEM Dashboard has a feature called ‘sidekick’, which can be used for dragging blocks and for managing the properties of the page. It has some extra features as well from other WCM’s such as being able to show a preview of the page or publishing it. Adobe has a host of other solutions like Adobe Analytics, Adobe Audience Manager, Adobe Campaign, Media Optimizer, primetime to name a few. These services along with the Adobe Experience Manager helps to not only to build and manage a large base of user segment. With the help of Audience manager and Adobe Campaign, you can easily segment your audience, create content specific to the liking of your user and launch cross-platform campaigns to promote your article. After you are done with your campaign, you can use the Analytics to know how effective your campaign has been, what is the reach of your post etc. AEM comes with a preinstalled out-of-the-box building blocks or components which can be used in web pages to visualize certain content. By using the simple drag and drop interface, publishers can make great web pages or apps only by using these components. The main advantage of out of the box component is that it gets reflected in the lower development costs, and helps in faster deployment. So your website developer doesn’t have to concentrate on writing on the code more. Another advantage of “out of the box” component is that it offers full support by Adobe, meaning the features will be upgraded on a timely basis. Adding thumbnails to the images automatically. The Adobe Experience Manager is ranked very high in a report made by Forrester on the effectiveness of WCM vendor providers globally. Ten primary reason for this was that most of the WCM vendors don’t have a cloud support or even if some WCM’s provide a cloud support, they don’t provide the full suite of services. Adobe provides a host of cloud services along with its other products which makes it much affordable for organizations who want to take their entire process on the cloud. Adobe believes that marketing efforts any company should be intertwined with the company’s other goals and not taken separately, this is another reason for selecting Adobe Experience manager. With the coming of new age, new digital content is published every day. It becomes very difficult to understand for the consumers which content to read and which content to skip. That’s why AEM has built a personalization engine within its WCM, which filters content according to the profile of the visitor. AEM does this by capturing information about the visitor’s location, the relationship to the available products, his usage history, search history and much more. 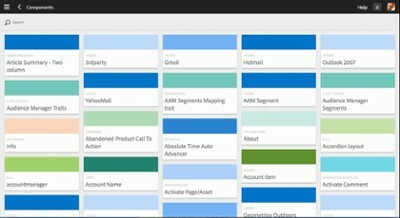 The main advantage of AEM is does that it becomes very easy to personalize when the user is logged in. So if for example, a visitor is particularly looking for a discount coupon, then AEM has this feature in which depending upon the search history of the user, it will give suggestions to the user. Adobe Experience manager, has been on top of many research reports as a Web Content Management solution for Enterprise organizations. Coupled with other services like Analytics, Audience Manager, Campaign, experience manager, Media Optimizer, primetime, social and target, AEM gives a complete package of a solution. To meet the challenges of the fast-paced and fickle minded consumers, organizations must invest in new technologies and processes to compete with others. They have to become agile, adaptive and innovative to stay at the top of their game. 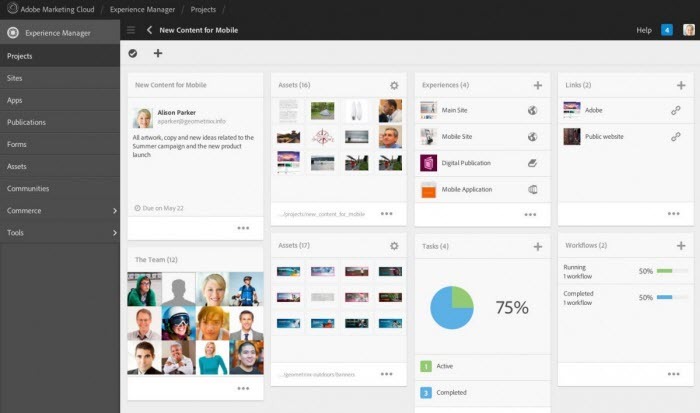 Adobe Experience manager overcomes the challenges that organizations face in terms of rigorously measuring and analyzing results and to refine the user experience for maximum conversion and retention. The features mentioned above are some of the prominent features that have been designed according to meeting the demands of the market. This shows that AEM’s marketing and sales goals aligns perfectly well with its business goals.